Israel Book Shop presents the epilogue of a new online serial novel, Divided Attention, by Esther Rapaport. Check back for a new chapter every Thursday or Friday. Click here for previous chapters. If not for the rag that wiped the dust off each Thursday, the cover of the keyboard that Abba and Ima Cohen had bought Rafi for his eleventh birthday would have been completely gray with dust. No one had touched it for the past year. A light evening breeze blew through the open window as Rafi entered the empty room, placing his suit and hat on the bed. This was the same bed that had warmly accepted him at age nine, and although more than seven years had passed, there was nothing that could compare to its comfort. Ima had been saying for years that they had to replace the bed, but Rafi thought it was needless. In the dorm rooms where he sometimes rested in the afternoon, there were much newer beds, but there was something about sleeping at home each night. He did not know how he would give it up next year, when he would be dorming in a different city. Perhaps it was strange that a sixteen-year-old boy still needed the security and protection that only a home could provide, but that’s the way he was. Nava said that it was very normal, and that everyone finds it hard to get used to full-fledged dorm life at first. Ima said that it might be more pronounced with him because of what he had lacked in the past, and Abba said they would ask Reb Shlomo if he thought they should apply to a local yeshivah gedolah in Yerushalayim, or if he should go to a different city. Abba claimed that a dormitory was very good for the maturing process. Did he still need to become more mature? Apparently. If he was able to miss the feeling of the keyboard keys under his dancing fingers, then he probably was still quite babyish. One week. That’s all it took to become completely sold out. And, mind you, this wasn’t an ordinary week, either—it was the week of the mammoth blizzard in the New York area that had entire cities shut down! Yet that didn’t deter people from going out to buy their copy of The Rebbe. What is it about this book that has people devouring it by the stacks? The Satmar Rebbe was a visionary; a founder. Throughout his leadership that spanned 73 pivotal years, the Satmar Rebbe changed the course of history for world Jewry. He was the father and mentor to thousands who sought his voice of truth and benevolent blessing. Fortified with kedushah, yiras Shamayim, and ahavas Yisrael, the Rebbe forged a trail for generations to follow. In The Rebbe, Rabbi Dovid Meisels, author of the popular Secrets series and himself a relative of the Satmar Rebbe, has produced a magnificent portrayal of this great tzaddik. Read this book, and you will feel the inspiration uplifting you. Turn the pages (all 584 of them! ), and you will see how the Rebbe’s tremendous influence and presence are still resonating worldwide in so many ways. You must read it yourself to see what we mean! After the success of the first printing, the book went for a reprint, which is set to come in this week. Don’t lose your chance again! 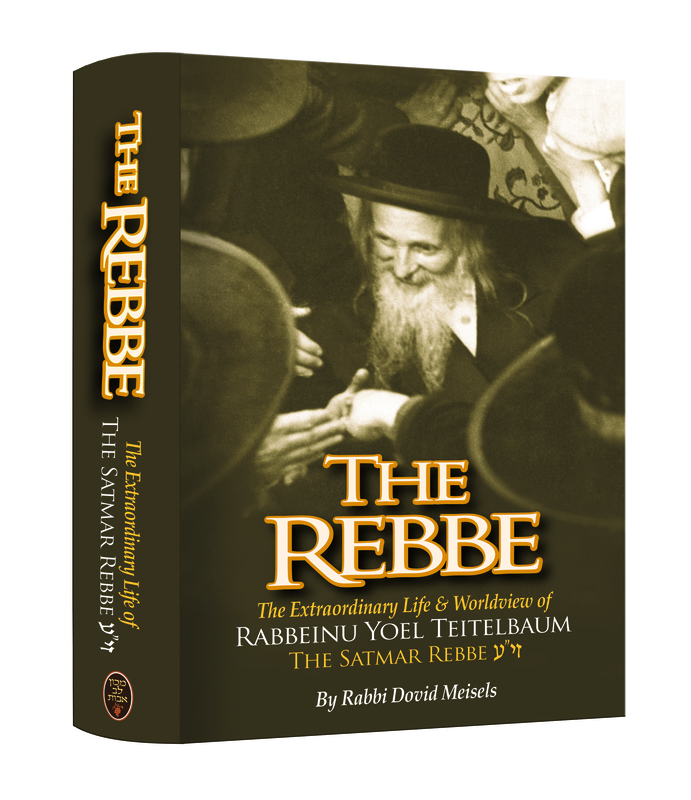 Ignore the wintry frost, and come buy yourself a copy of The Rebbe right away, while it’s still around! Although you may be shivering from the cold, reading this book will ignite a blazing and toasty fire within you that will warm your insides, guaranteed! Israel Book Shop presents Chapter 34 of a new online serial novel, Divided Attention, by Esther Rapaport. Check back for a new chapter every Thursday or Friday. Click here for previous chapters. Manny and Mr. Cooperman, who were both sitting beside Rafi, exchanged a fleeting glance. “I want to talk to you,” Rafi said quietly. “You mean the money?” Rafi glanced to the left. Manny smiled at him encouragingly. Israel Book Shop presents Chapter 33 of a new online serial novel, Divided Attention, by Esther Rapaport. Check back for a new chapter every Thursday or Friday. Click here for previous chapters. It seemed as though everything that had to be said had been said; all the relevant questions had been asked and all the murky issues had been clarified beyond a shadow of a doubt. Yael was silent; so was Nava. Nava rose, and for the first time in her life, she understood the expression “weak-kneed.” He knees simply refused to straighten and carry her to her room. “Just a minute, Nava; one more question,” her father said in a low, restrained tone. Nava stopped warily in her tracks. She’d received enough rebuke this evening, and rightfully so, although the admonishment had been much gentler than she had feared. Her parents had listened to her in silence, then asked many questions, trying to understand, to sort things out in their minds, and to think about what to do next. And yes, they also wanted to know her motivations for remaining quiet. She had tried to explain, to make it clear that it had been Rafi’s condition, and that she had promised him. She tried to tell them that she had also been in the dark until a mere five days earlier. Her parents did not understand, and it was no wonder. Morah Ayala hadn’t understood either. And then the conversation had turned to Rafi’s mysterious friends and the various options of how to handle the problem. It was as though her father had locked her issue in a box and decided not to open and discuss it. And now, after that whole conversation, once she had already stood up to go to sleep—though she knew that sleep was one thing that would undoubtedly elude her that night—Abba wanted to ask another question. Nava wanted to say that she was sure about that, but suddenly, she wasn’t so confident anymore. “I really don’t know, Abba,” she whispered. Israel Book Shop presents Chapter 32 of a new online serial novel, Divided Attention, by Esther Rapaport. Check back for a new chapter every Thursday or Friday. Click here for previous chapters. Manny entered the Rav’s room. Manny fixed his gaze on the lace tablecloth that covered the wooden table.